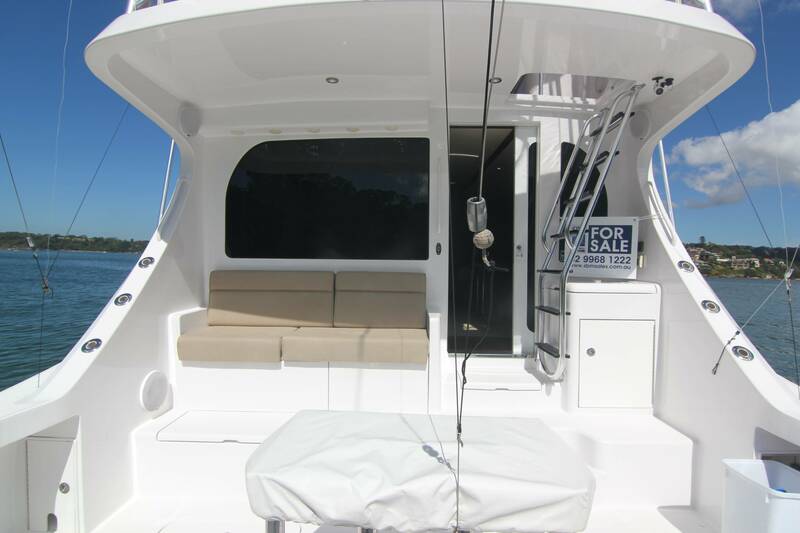 Just Listed - 2013 Hatteras 54GT powered by twin Cat C18's ASCERT with 1000 hrs only. More options than the luna space shuttle, you need to inquire with the office and request a complete & and just simply arrange an inspection. 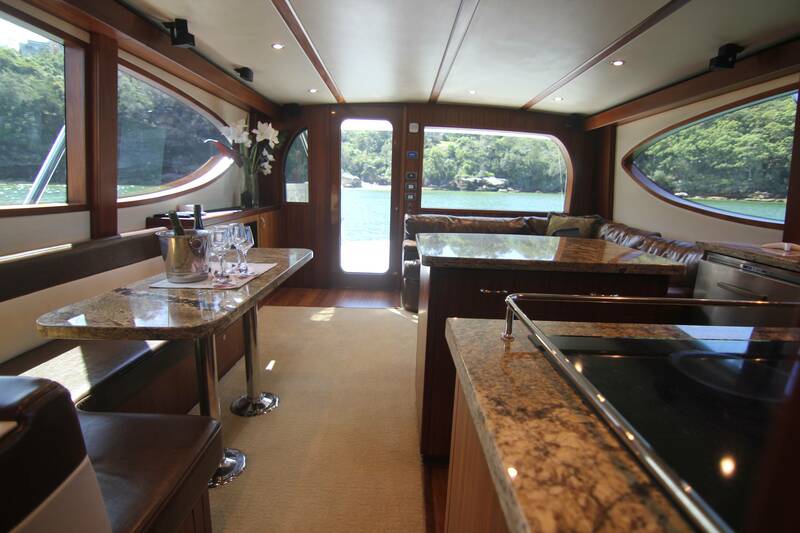 This boat is simply set up to play on the harbour, run up and down the coast to local ports and or if the appetite prevails even further and this boat can do it in 5 star luxury !! 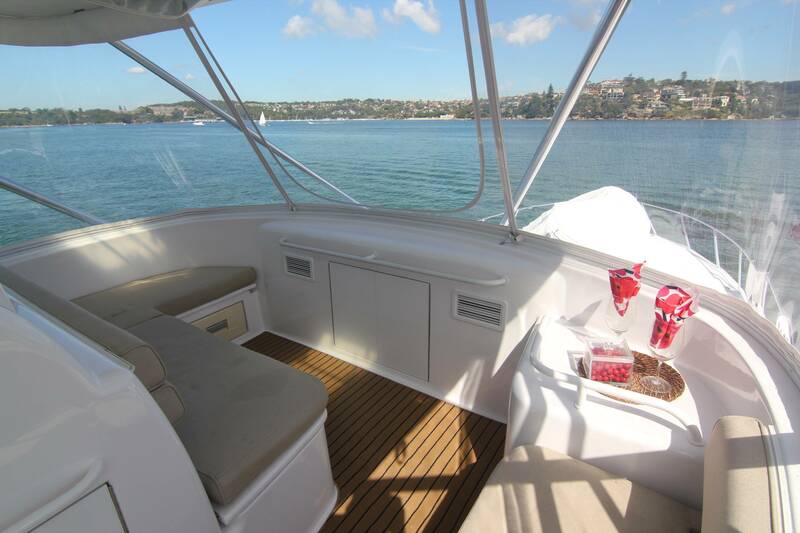 When a conservative builder like Hatteras comes out with a new boat, it's big news – but if it's a whole line of new boats, it's three times as interesting. 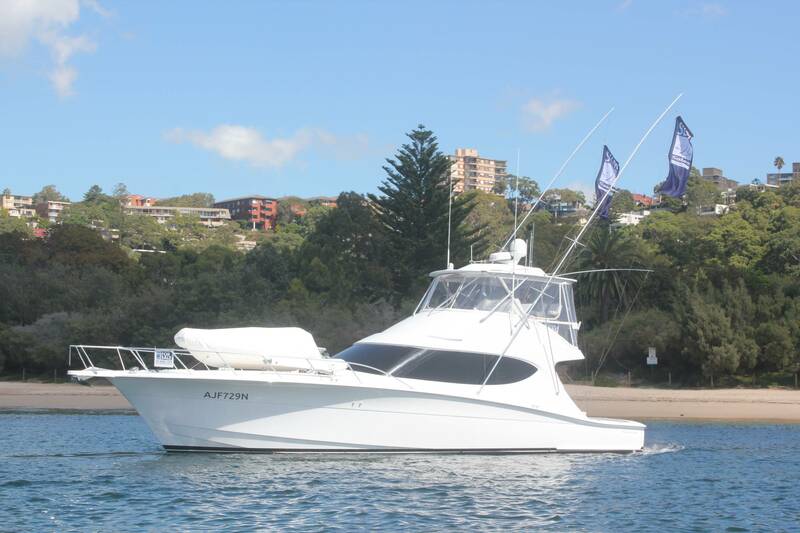 The GT Series of sportfishermen/convertibles includes the GT60, GT63 and the model featured in this report, the GT54. 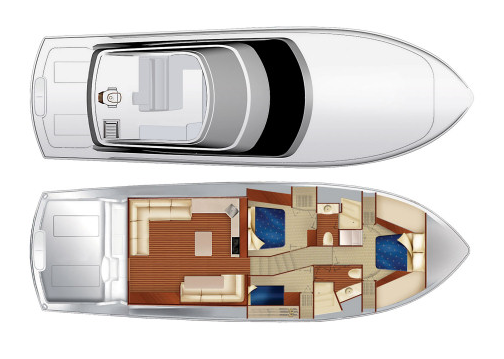 With designs inspired by fast, comfortable and seaworthy Outer Banks custom charter boats, the new Hatteras yachts share hull forms and profiles among themselves, but are much different from similar-sized boats previously built by the company. 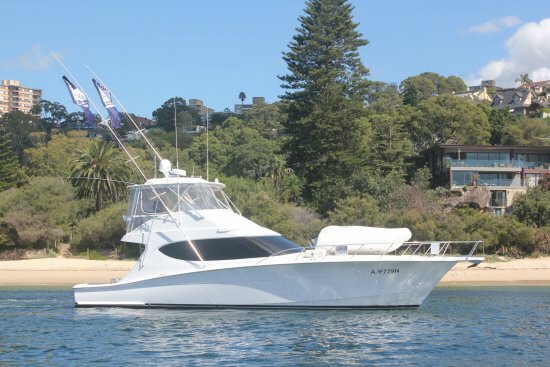 With the GT54, Hatteras is carrying on its 57-year mission to build the most capable boat possible for offshore big game anglers, but also for cruising people who want a salty looking, fast boat and not a gin palace. 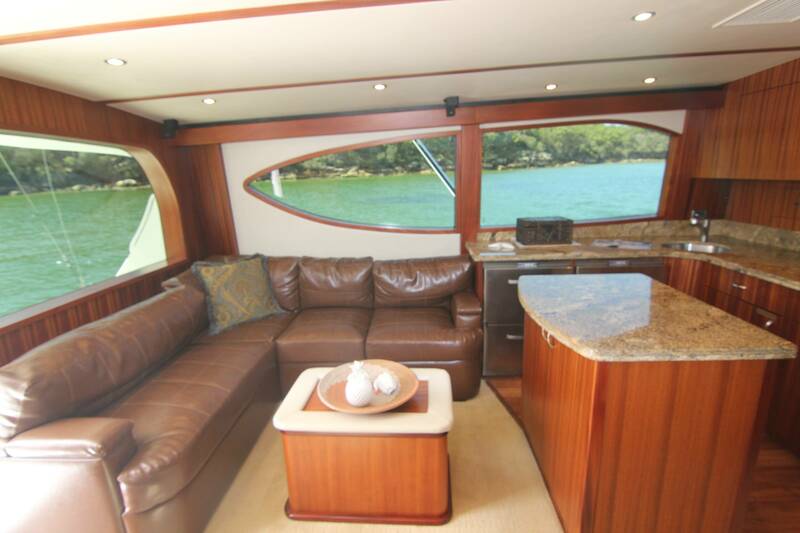 Hatteras had a winning hull with the 54 it introduced in the early 2000s, but its house profile needed up-dating. 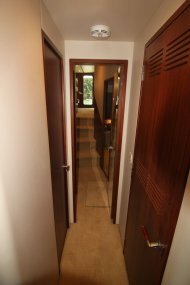 While redesigning the house the sheer was also modified and classy, rounded tumble home was molded into the stern quarters of the hull. 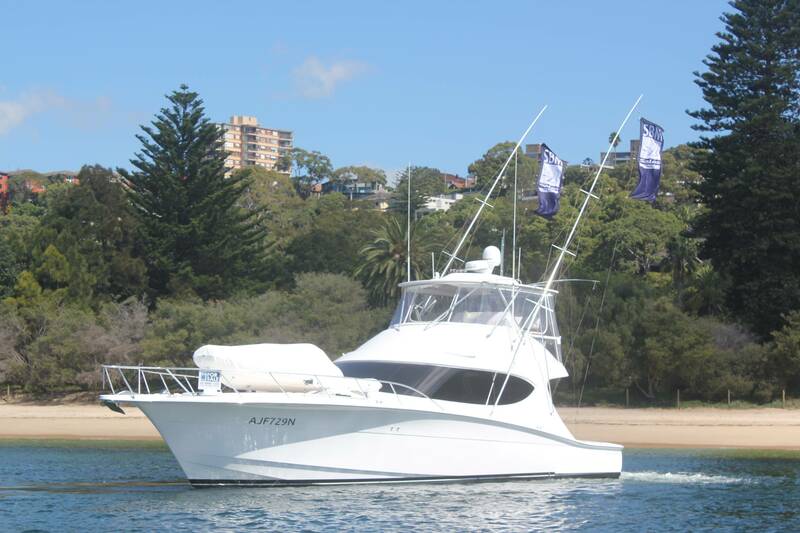 Finally, the boat's mission with her big engines was to break the 40-knot barrier fully loaded. In a word, the mission for the GT54 is to be the fastest, best-looking, most functional 54 convertible on the market at a compelling price. In addition to reducing draft, the GT54's prop tunnels also reduce the shaft angle to just 6-degrees, significantly less than other boats in class. 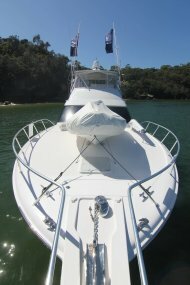 By being nearly horizontal the props are more efficient and the boat can run faster. Less Beam and Lighter Weight. 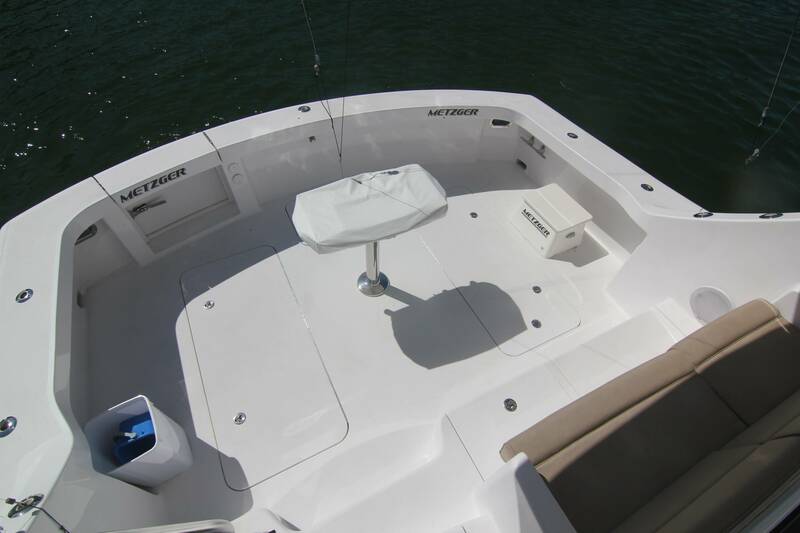 Because the GT54 has 6"-7" less beam than others in class she has less forward resistance when moving through the water. 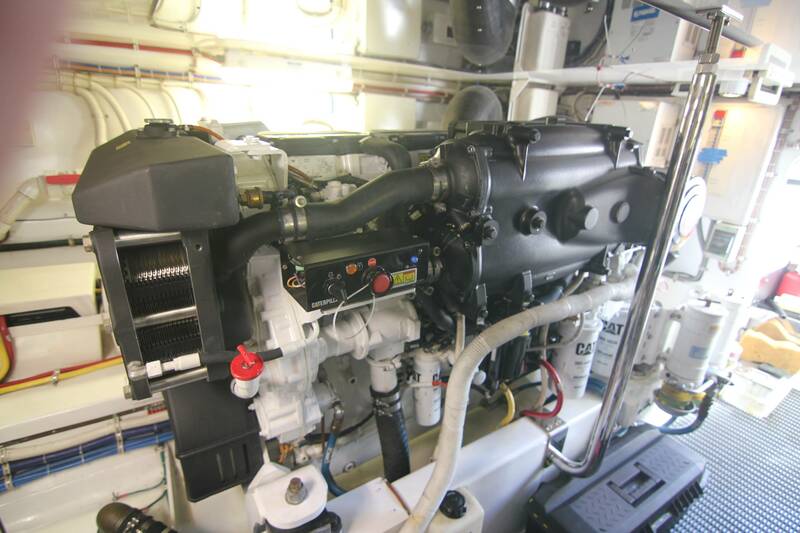 She is also lighter with the big optional engines when fully laden than most of her competition making her more efficient with equal power. 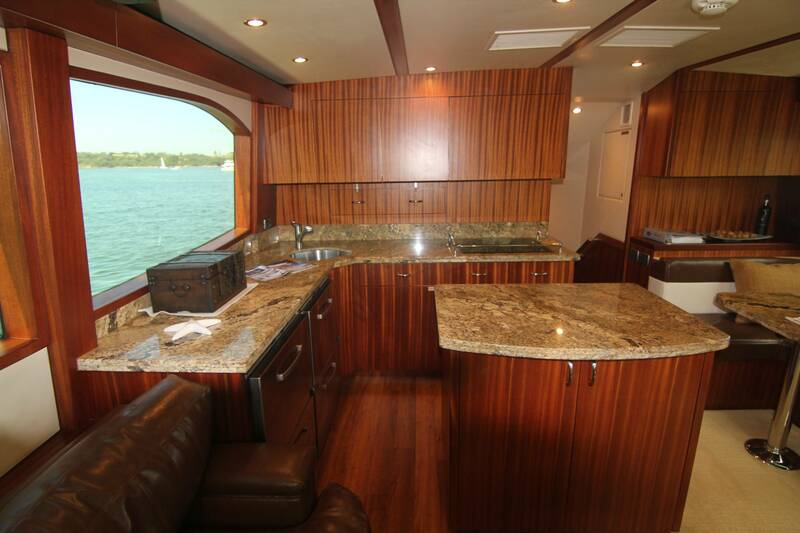 Open Galley with an Island. 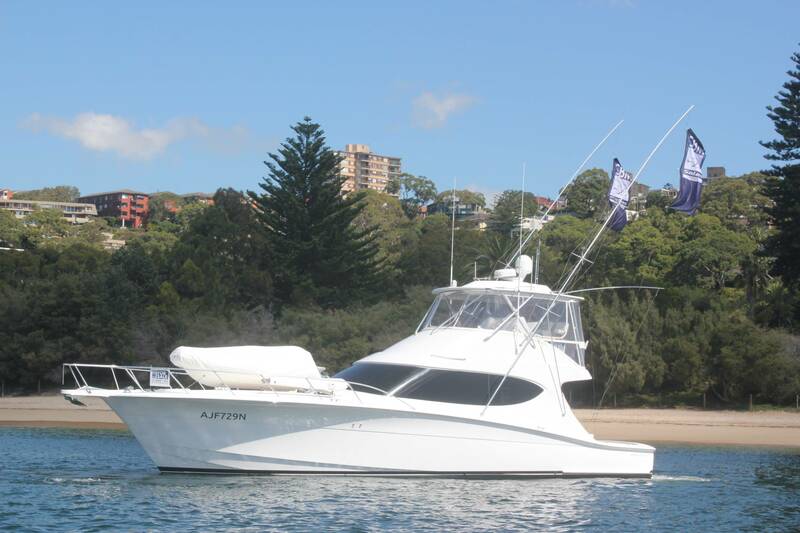 The boats big 35”(80.9 cm) five-bladed propellers are extremely effective. 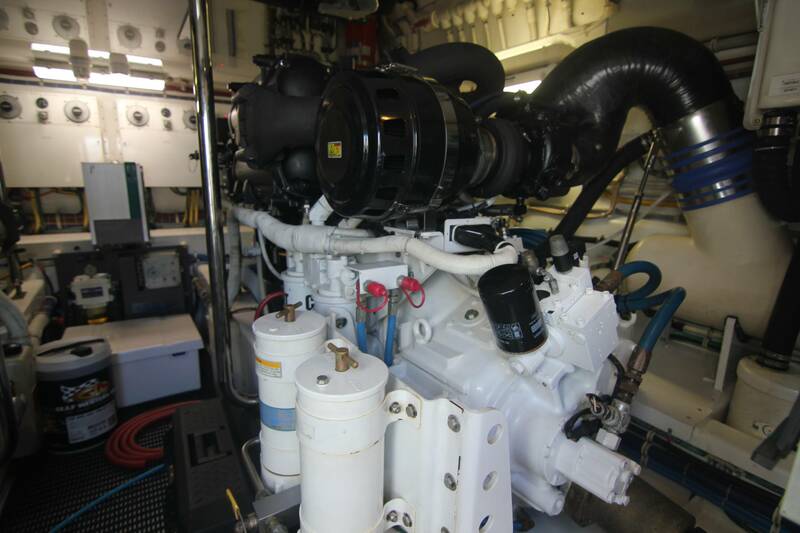 At idle speed, her 1150-hp CAT were pushing us along at close to 9 kn. 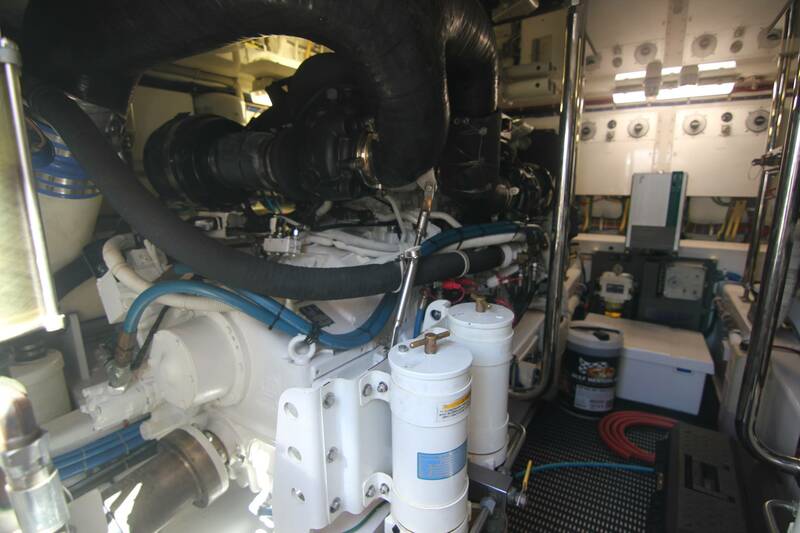 Obviously this won't be an appropriate speed when operating in close confines so CAT’s engine controls feature a slow vessel mode. When engaged, the idle speed drops to 7.7 kn. 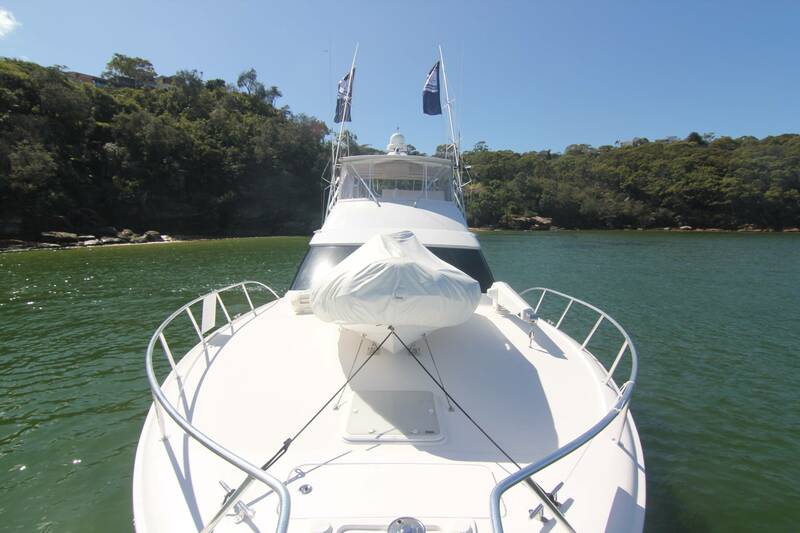 Of course, even with the slow vessel mode activated the GT54 is an incredibly responsive vessel. 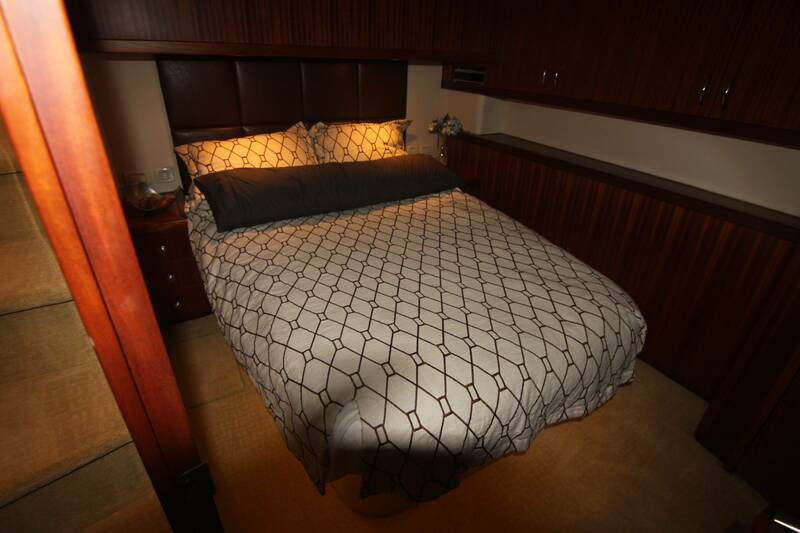 In fact, that is one characteristic that the entire Hatteras Yachts line seems to share. 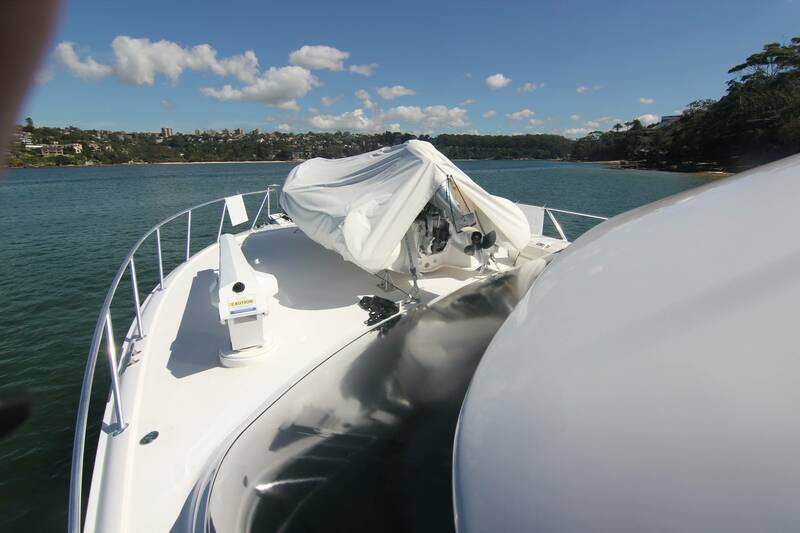 Once we reached open water it quickly became clear that the GT54 is a boat that wants to run. Her hull design allows her to get on plane in as low as 1450 rpm. Once above that speed, then it's time to let those 2100 horses run free.The GT54 is a surprisingly fast boat and that makes her a very cool boat to operate. 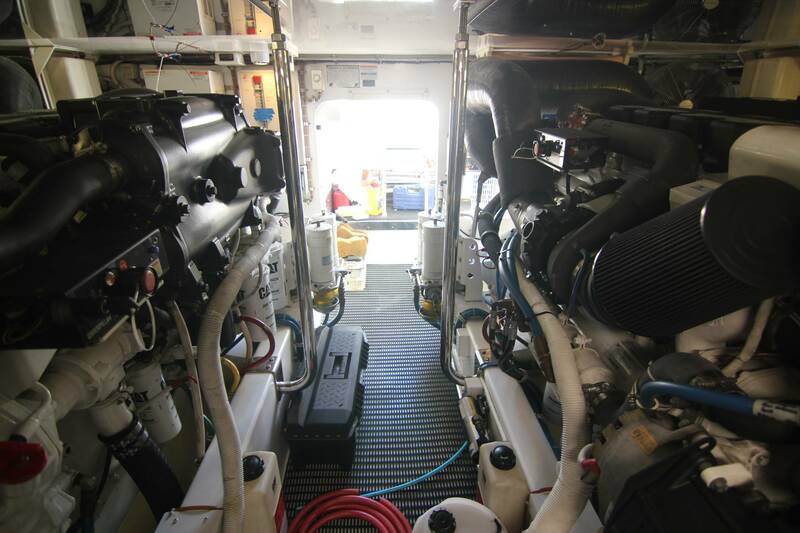 At nearly all settings the feeling of speed is astonishing, but no more so than when this 75,000 lb. (34,019 kg.) boat is moving above 36 kn. It is really something to experience. 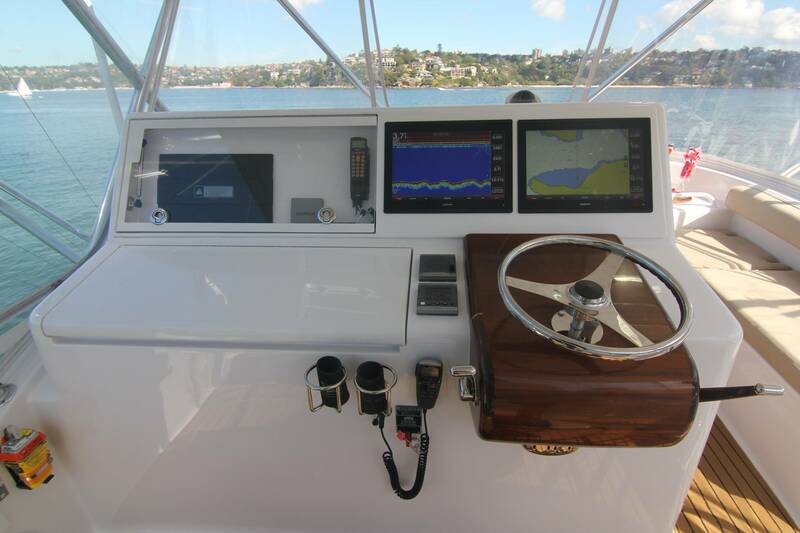 When fishing, she has a minimum trolling speed, with the trolling valves engaged of course, of 2.3 mph at 700 rpm while burning only 6 gph. The responsiveness of those big props also comes into play when backing down on a fish where I had complete controllability of our direction while maintaining an average speed of 7 knots . With her 75,000 lb. (34,019 kg.) 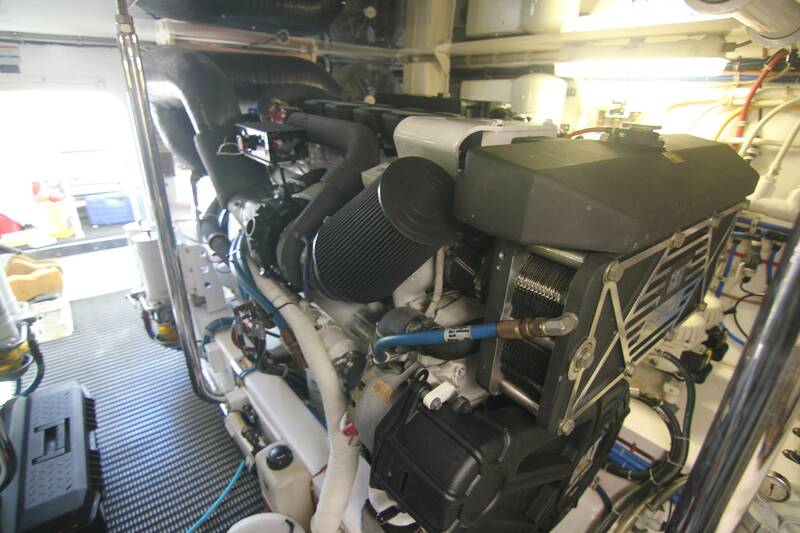 empty weight, 360 gallons (1,362.7 L) of fuel and three people on board we had a test weight of 77,715 lb. (35,251 kg). With a pair of 11050 CAT C18 turning 35” (80.9 cm) 56.5 pitch five-bladed props we reached a top speed at 2365 rpm and 35 knots. Best cruise was reached at 1950 rpm and 23 kn. 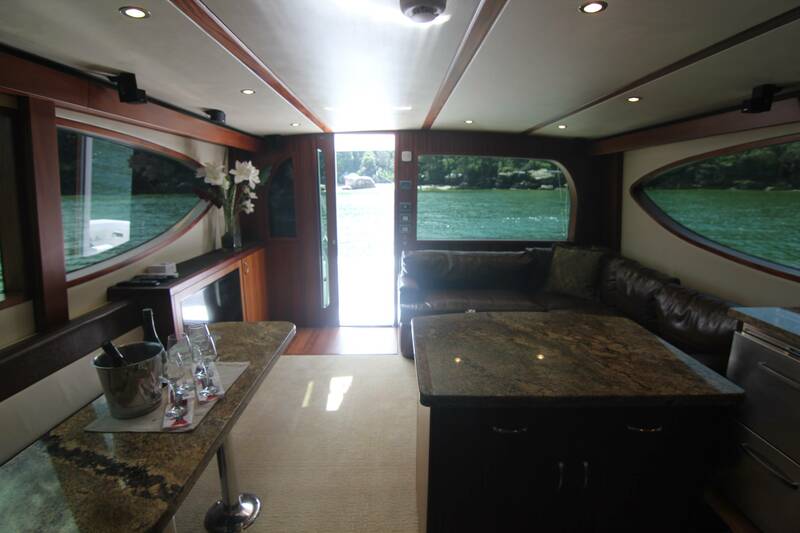 The boats had to be large enough to handle a party of four or six, comfortable enough in the typical six-foot seas for paying customers to want to come back, and be fast enough to get out to the fishing grounds with maximum trolling time and still make it back by dark. 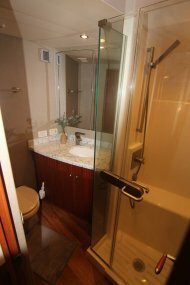 The vessel also had to be dry in the cockpit to keep customers happy. 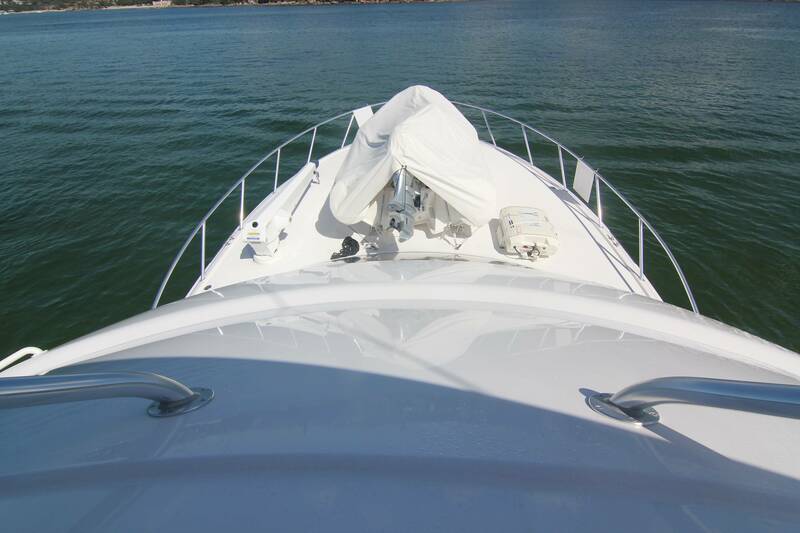 Finally, the boat had to be fuel-efficient because the cost of fuel was included in the price of the charter -- every gallon saved was money in the skipper's pocket. Using all the knowledge acquired over half a century, the company's designers created a tournament-ready cockpit with 135 sq. ft., including the mez seating. A mounting plate is laminated into the sole for an aftermarket fighting chair and there is adequate clearance both in front of the foot rest and behind the seat for mates to pass from side to side and guide the chair in the heat of action. 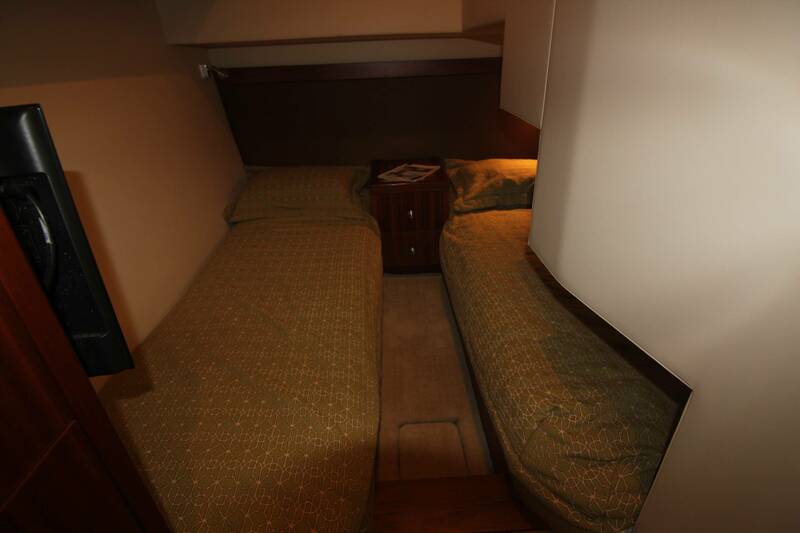 In-deck, twin 8-cu.ft. 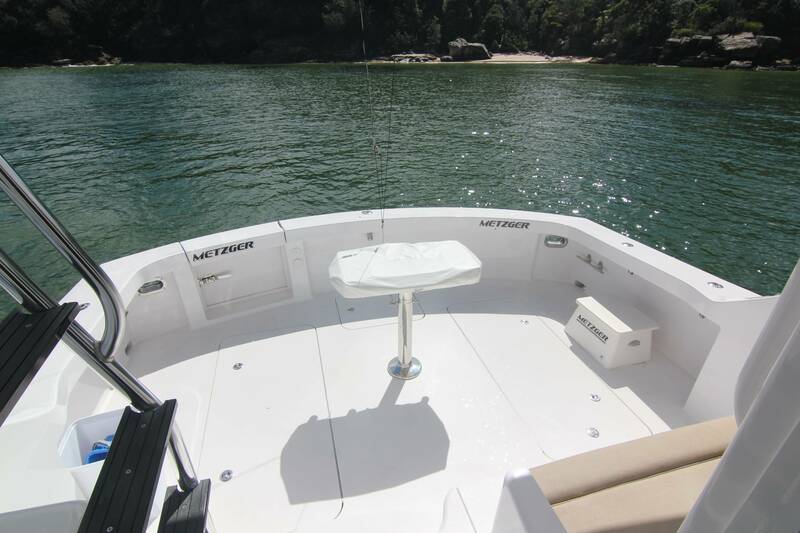 fishboxes handle the catch, and a re-circulating livewell in the transom holds the bait. 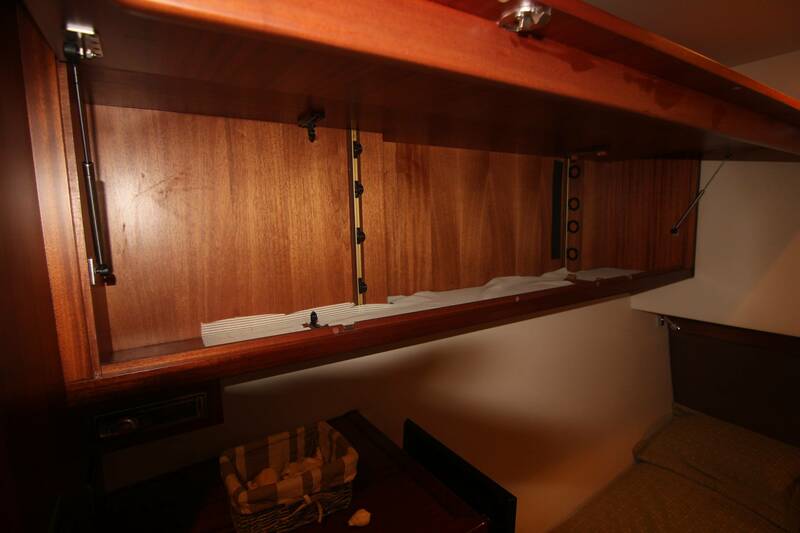 There are dedicated compartments for gaffs and boat hooks – no more keeping them in the rod racks. 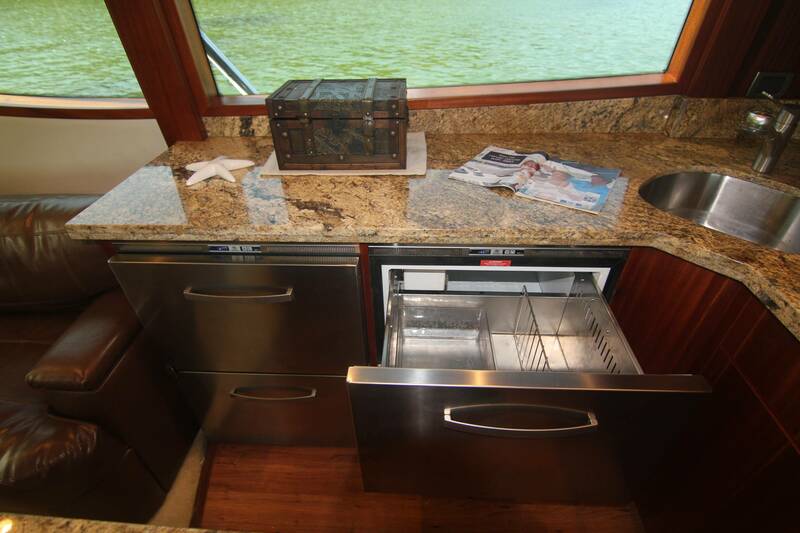 Tackle drawers and a cutting board are installed in the console to starboard against the bulkhead. You will find a comfortable mezzanine, with ergonomic seats, armrests, and proper back rests. 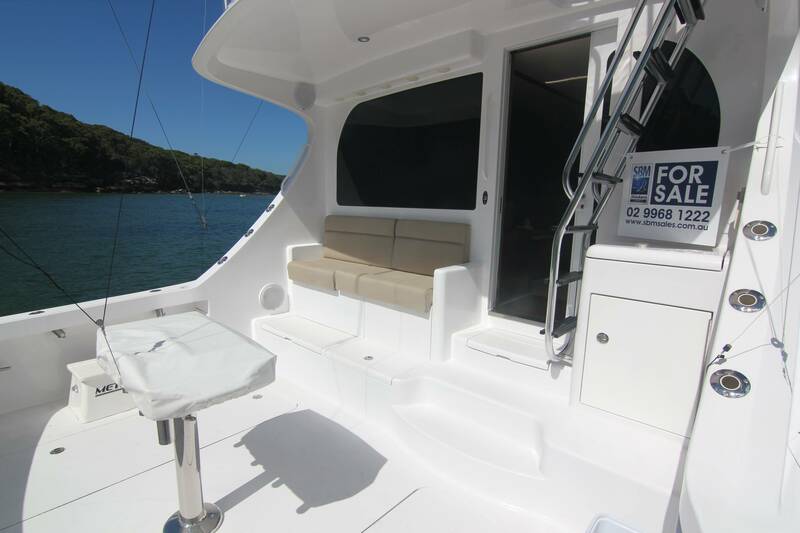 Under the seating owners can have most anything they want including bait freezers, cold plates, insulated ice chests or storage. 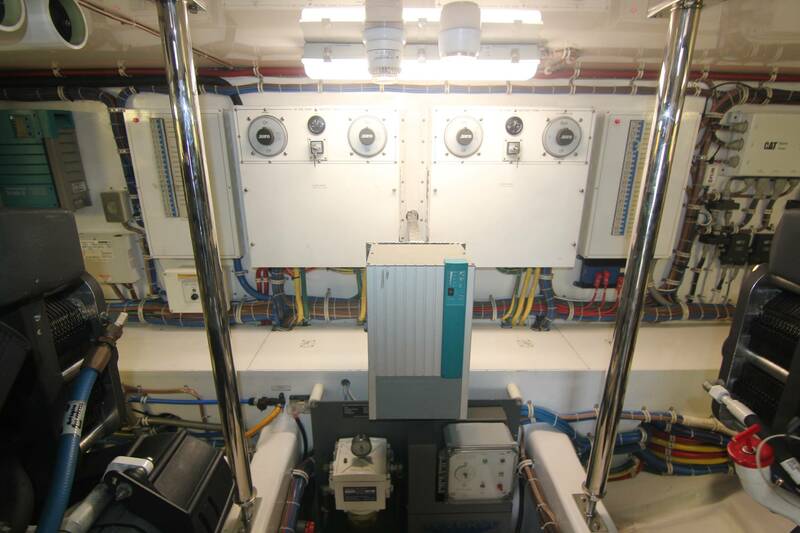 At the starboard end is the opening to the engine room. 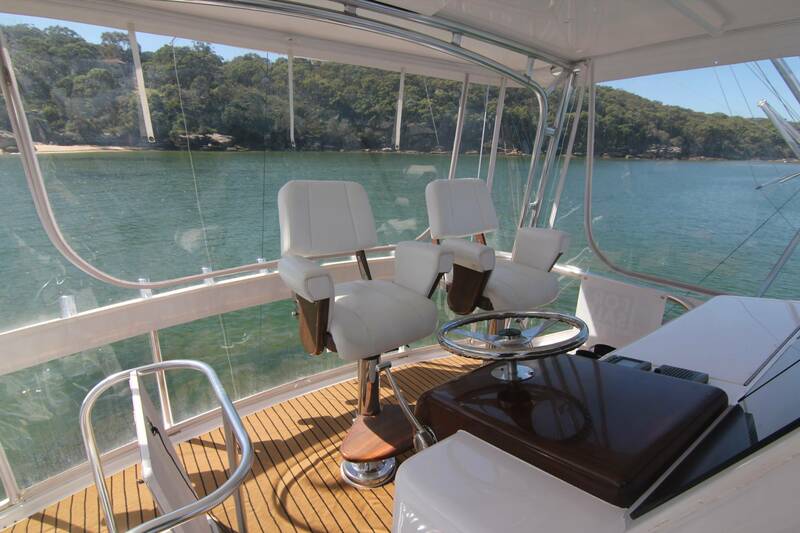 Many of the GT54 buyers are cruising people and they can customize the cockpit in any number of ways for both voyaging under power or entertaining. 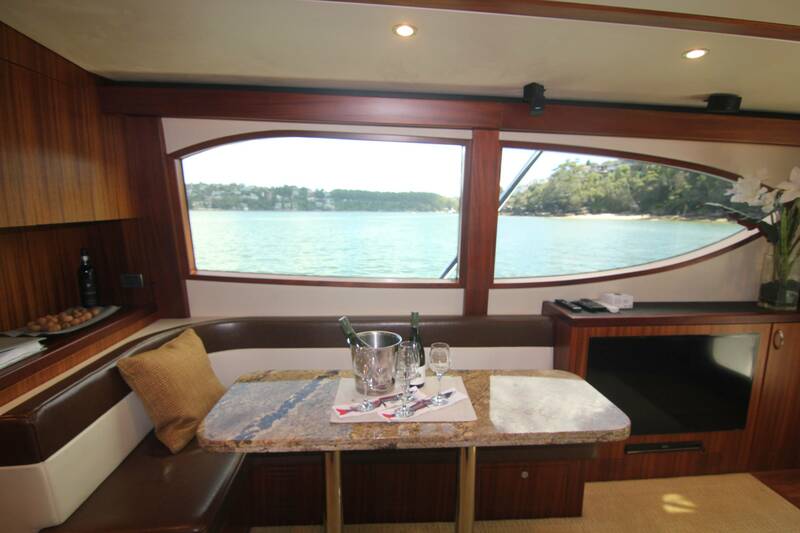 Fold-away seats can be put into the gunwales, fold-up lounge chairs and tables can be stowed in the lazarette and pulled out when needed. Even a sun awning overhead can be installed. All of this might sound shocking to Americans used to seeing battlewagons like the GT54 armed to the nines for big game, but Europeans view boats like the GT54 differently. They -- and increasingly more Americans, too -- see other possibilities for the 135 sq. ft. in the cockpit. 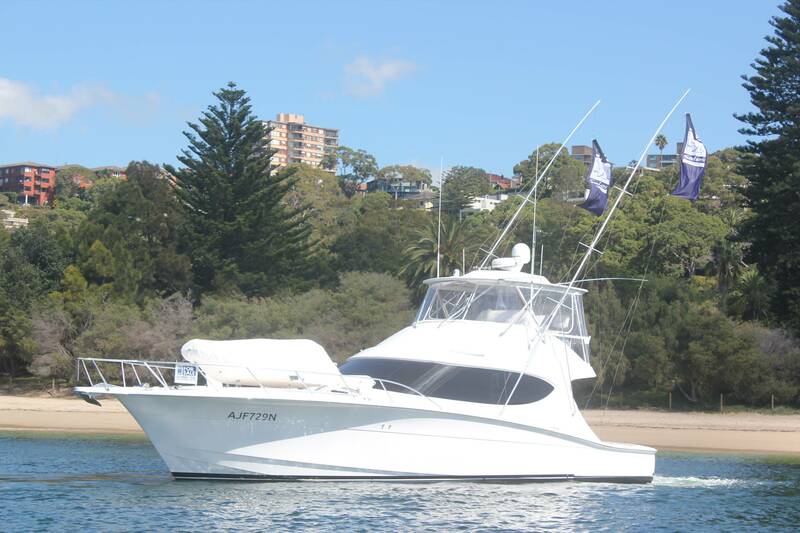 After all, the GT54 is a "convertible" which means she can be used for both fishing and cruising. 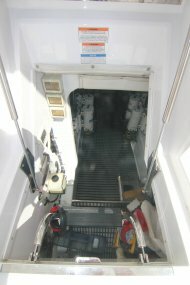 Access to the flying bridge is from the starboard side of the cockpit over the tackle drawers and cutting board counter. It is aluminium with synthetic treads for added texture. 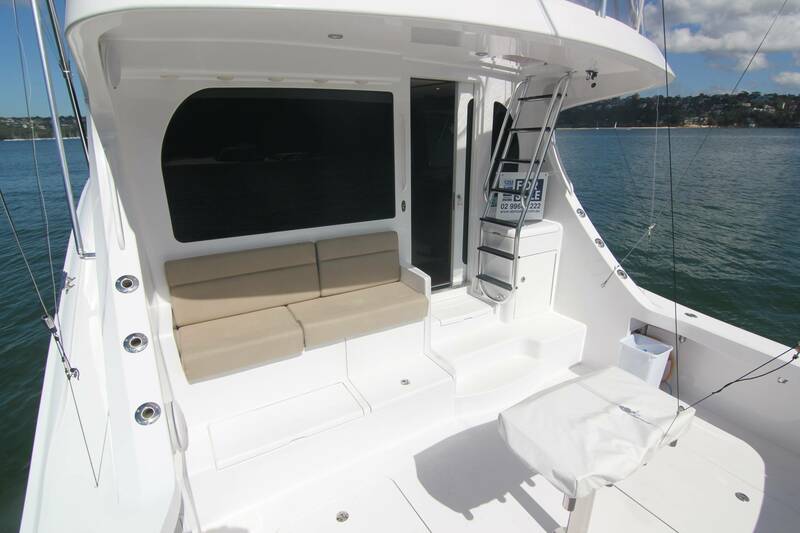 Once the ladder clears the console it has a 22-degree angle up to the flying bridge. This angle makes it easier and safer to climb. Once on the flying bridge our perspective is quite different. 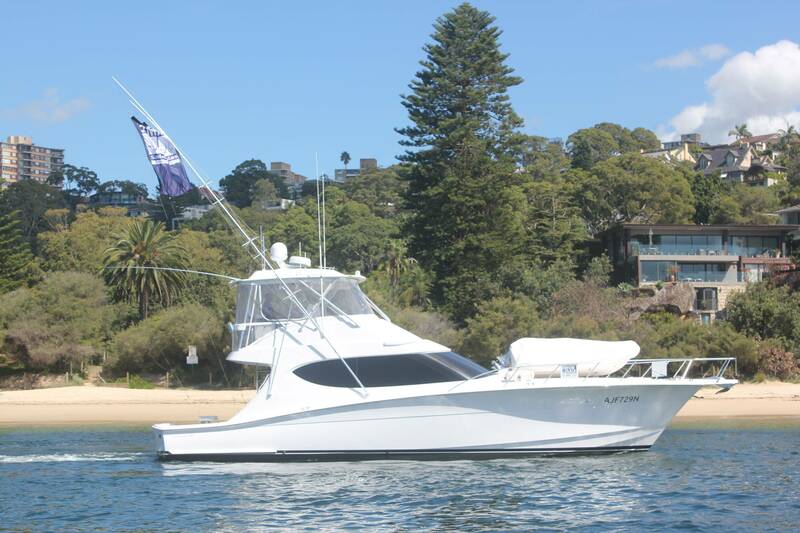 We like this basic, traditional design that Hatteras has used for years and has proven to be remarkably functional. 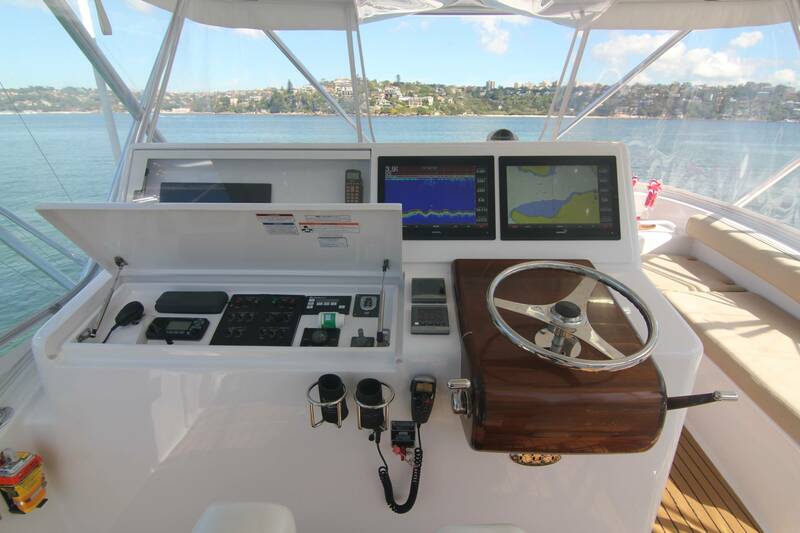 The helm comes standard with two adjustable chairs, Palm Beach control sticks on a pod, and there is room in front of the helmsman for two large screens. Other gauges are off to port and easy to see. Standing at the centreline helm all skippers can see the action in the cockpit and most will be able to see the bow as well. 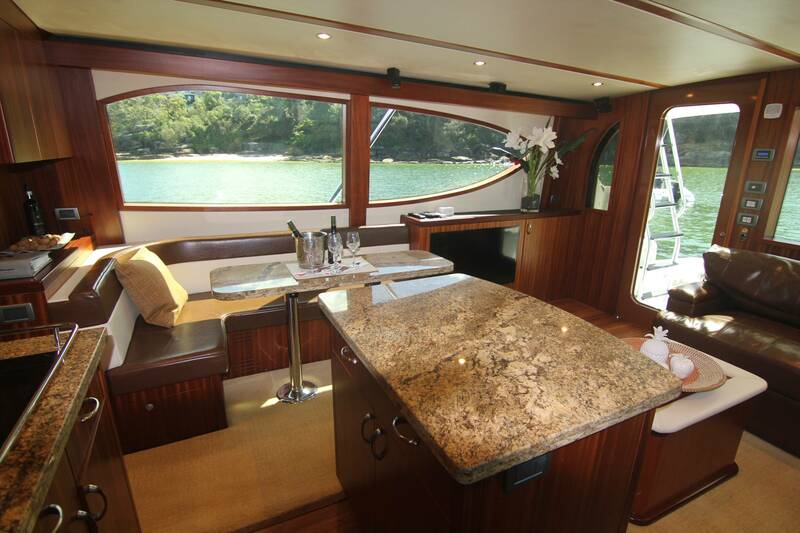 Some cruising convertibles have the helm forward and guest seating aft, but we like the 54's layout for cruising, too. Here's why: first, most guests like to see where they are going; and, 2) we like to have as many eyes as possible facing forward to help the skipper spot pots, kayaks, and flotsam. 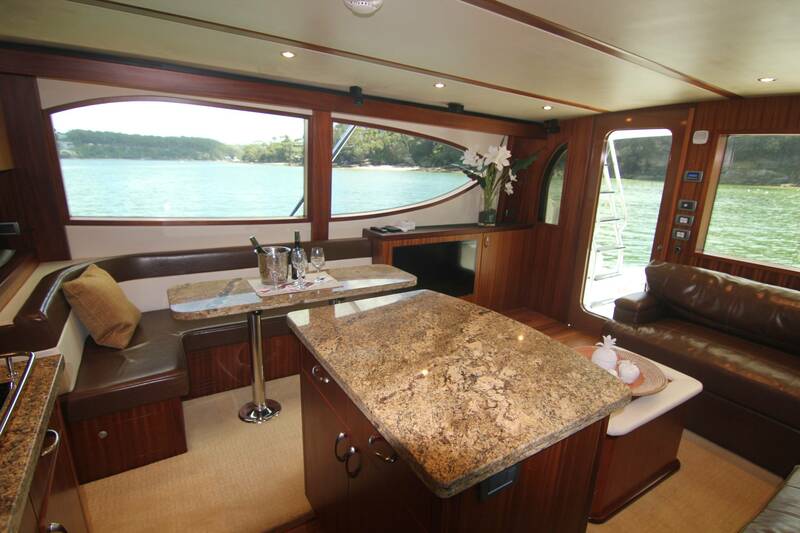 There is storage under the seats as well as a top-loading insulated compartment for drinks. Forward, in the cowling, is space to stow things such as flares and other gear. We recommend a hard top or at least a fixed canvas top for all convertibles. 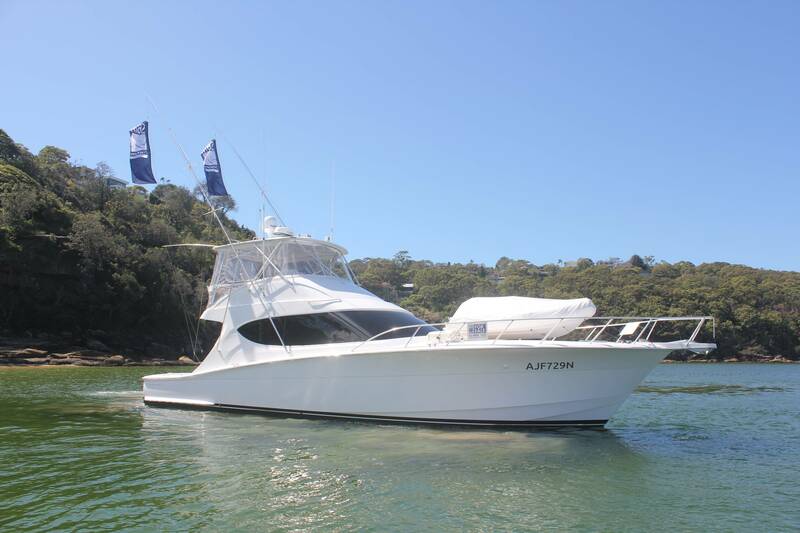 When the Hatteras 54 first came out in the early 2000s she had a hull bottom that was a departure for Hatteras. Her bow sections were convex to minimize the impact of rough seas or at high speed in normal chop. But convex bows were notorious for being wet. 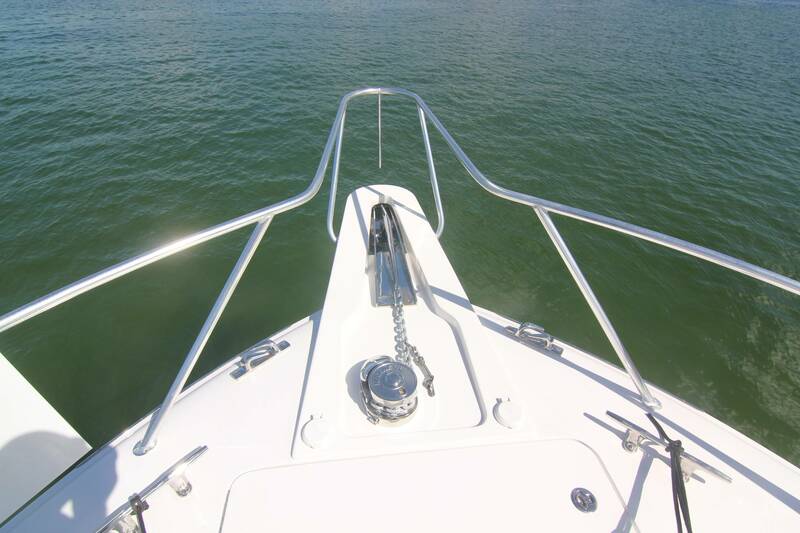 However, when Hatteras combined that shape below the waterline with Carolina flare above the waterline, a wonderful thing happened -- water and spray was thrown to the sides keeping the boat dry and the ride was comfortable. 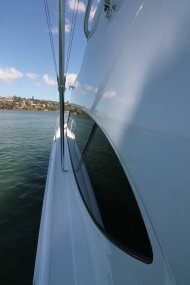 As the hull goes aft it warps with a variable deadrise. 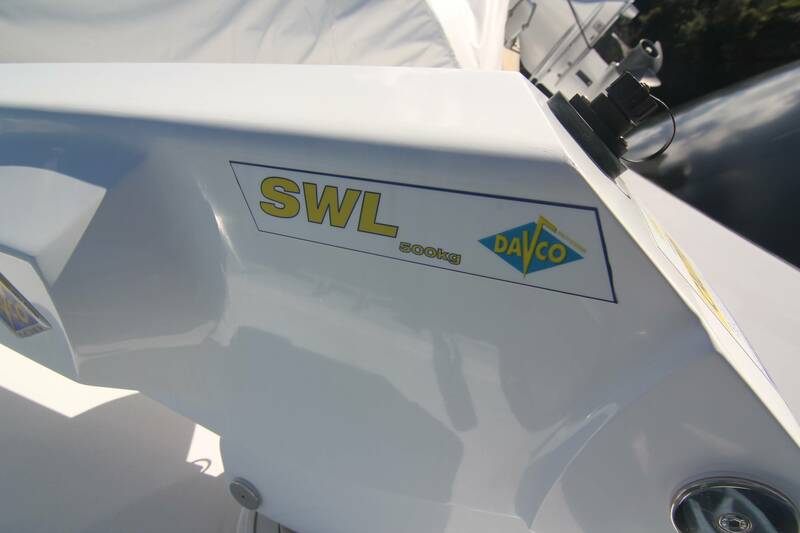 This is another key to the boat's performance. 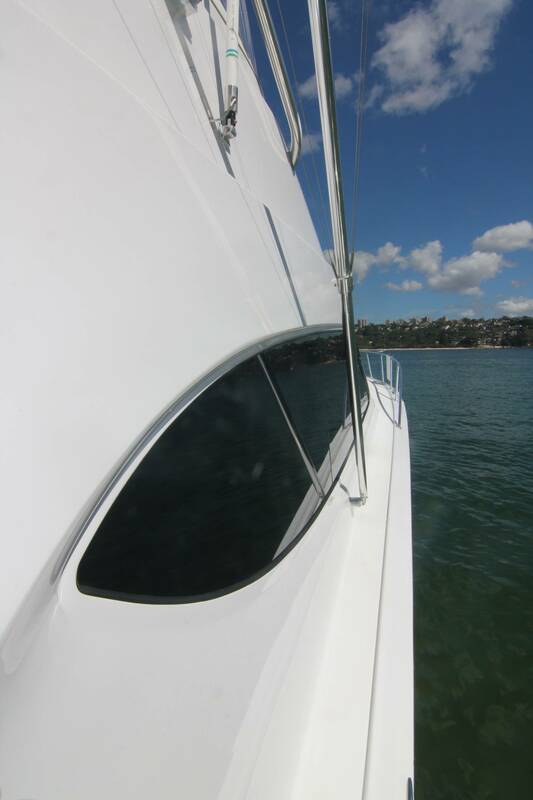 By creating nearly flat sections aft (just 3.75-degrees at the transom) the bottom provides remarkable lift and a optimum running surface for speed. 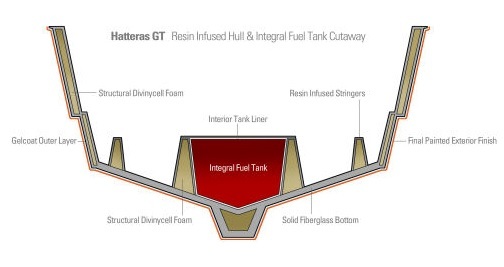 At the same time the increased buoyancy aft allows the GT54 to carry more weight and run at a 5-degree angle. The struts in the propeller tunnels are made of manganese bronze. The rudders are stainless steel and are connected through drip less logs to a pultruded fibreglass shelf for the rudder tie rods, hydraulic steering mechanism and autopilot. 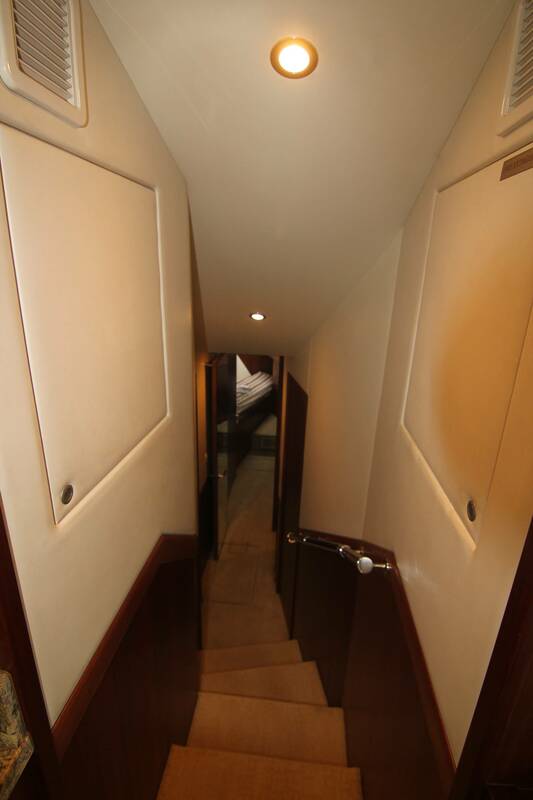 This is the only time we have seen a pultrusion (glass and special resin made with intense heat) used in this class of boat and it is an ideal material (because it is as strong as steel and won't rot) for this shelf that has historically been made of plywood. 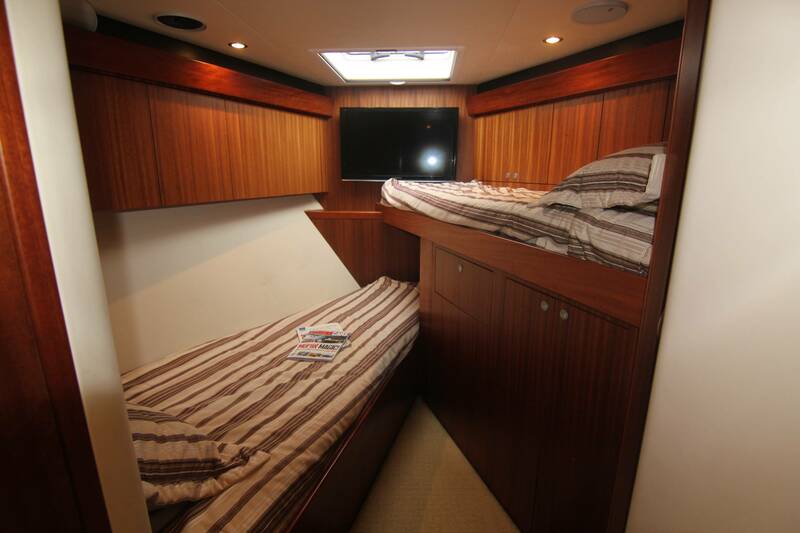 The GT54 has 5'9" (1.75 m) of headroom which is good for this size boat. 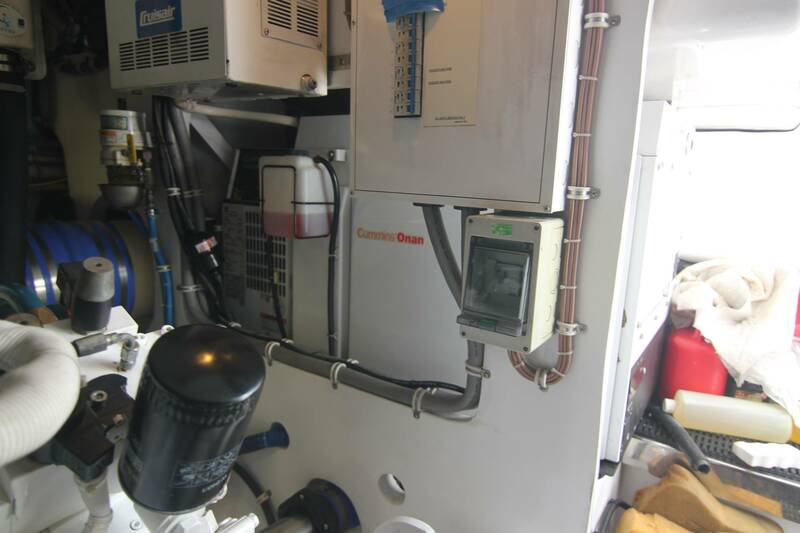 Because there are no engine room air boxes with water baffles and demisters, the outboard sides of the engine room have more room than they would otherwise. 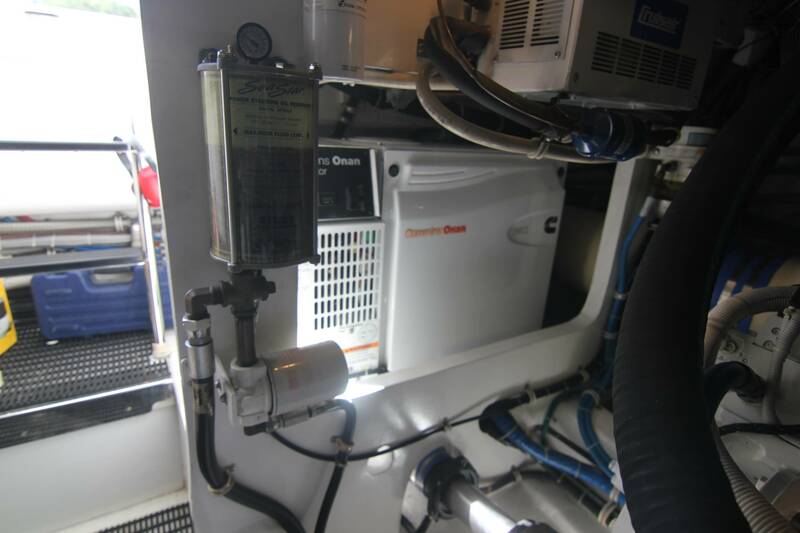 This makes it easier to move along outboard of the engines for inspections and also allows equipment to be installed here. 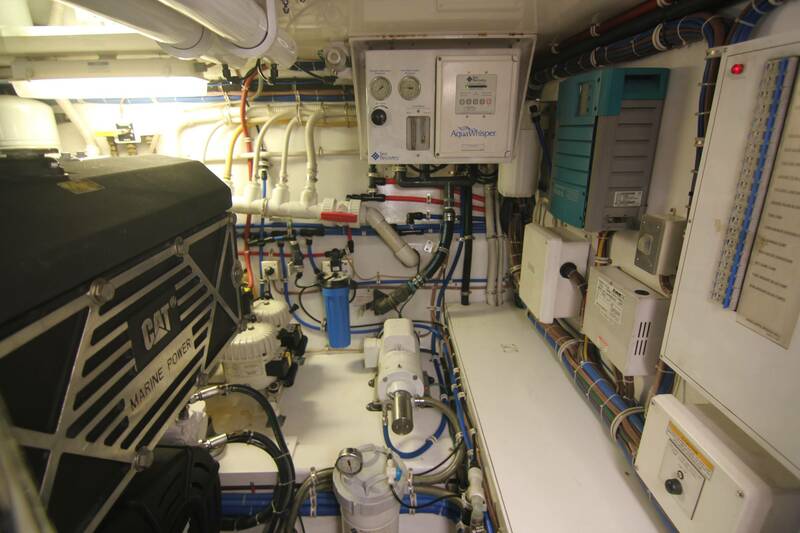 As a result, equipment like battery chargers, hydraulic fluid tanks, and sea chests for air conditioning cooling and deck drains can be easily placed on the hull sides. There is good clearance between the engines. 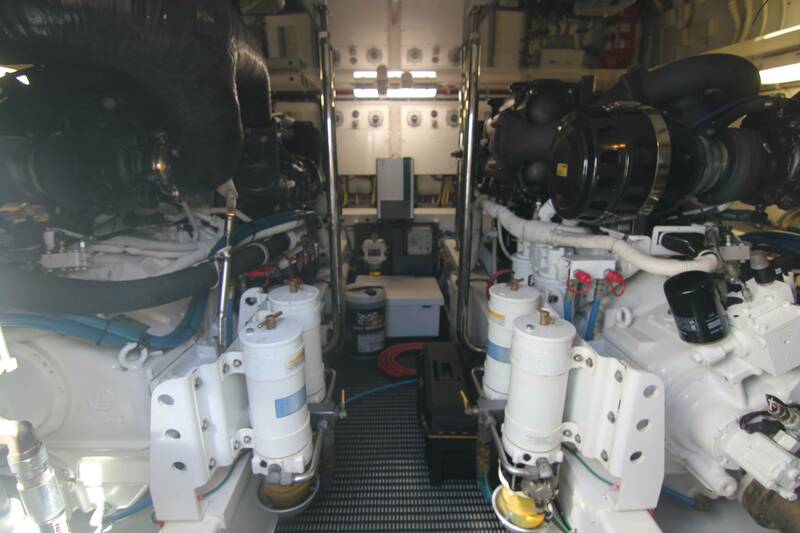 Getting past the engines in front is tight, but it is easy to get outboard behind them by stepping over the shaft between the marine gear and the generator. 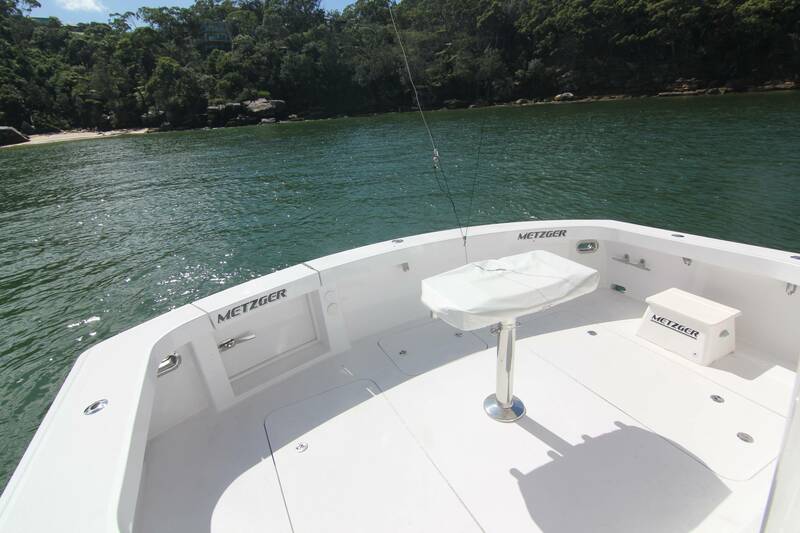 The boat comes standard with a 17 kW Onan gen set that runs at a relatively low rpm and is therefore quieter and creates less vibration. There is room for an optional second generator. 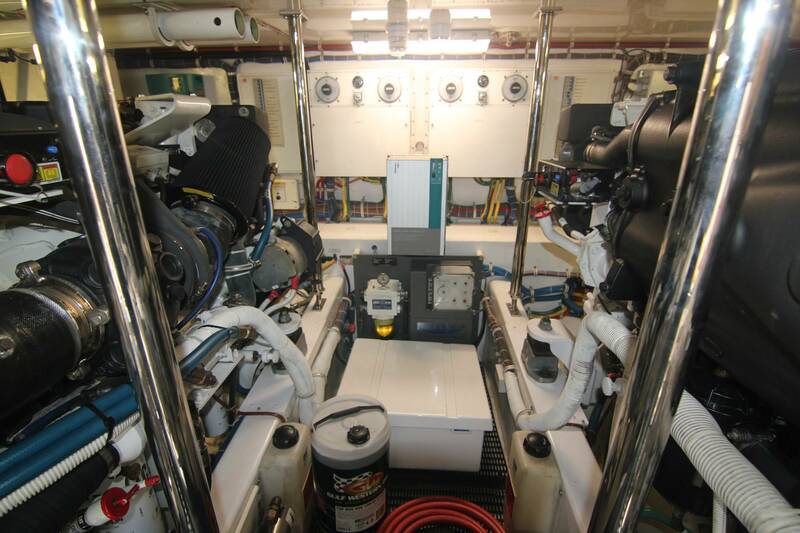 The engine room is painted with polyurethane paint which makes the surfaces smooth and easy to clean. 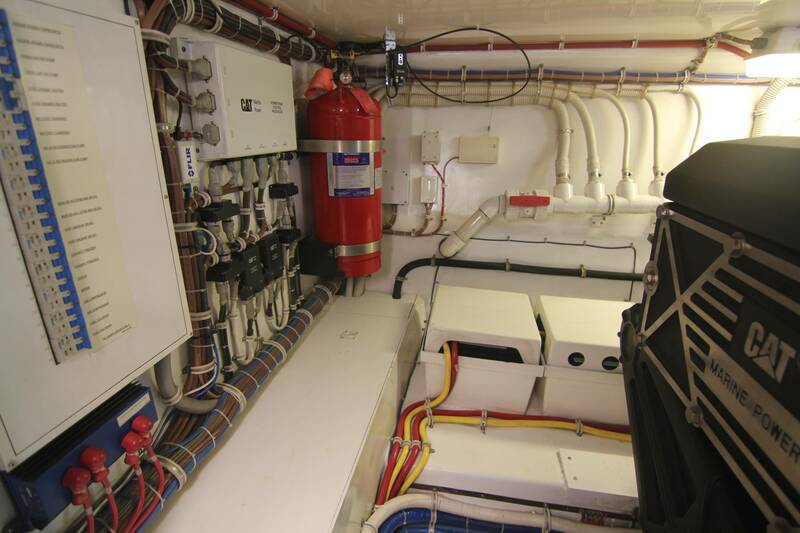 The 54 comes standard with an FM200 fixed fire suppression system. 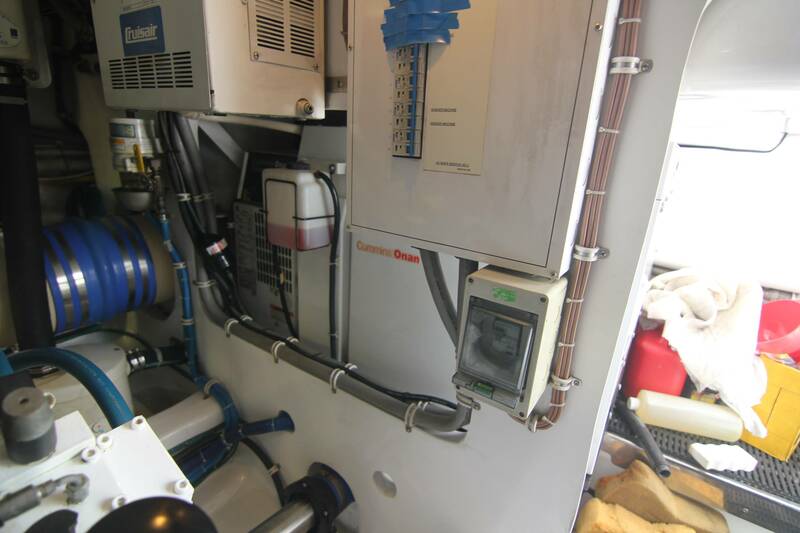 There are numerous bilge pumps with guards on the float switches and an emergency 150 gpm electric bilge pump in the lazarette. 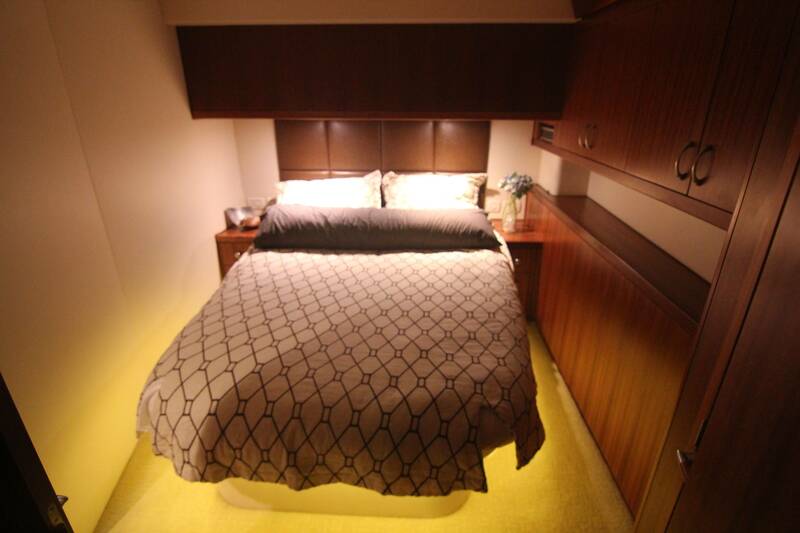 The GT54 has a galley "up" which is traditional in this size of convertible, but there are similarities with the past end. 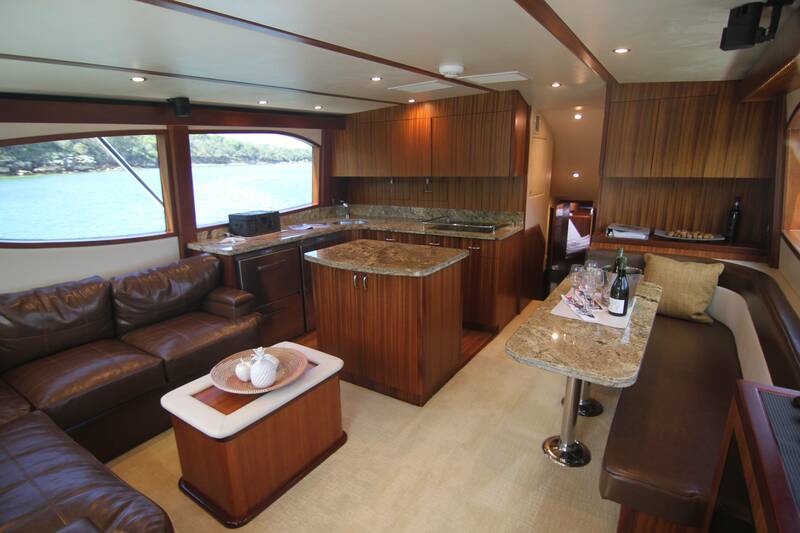 Hatteras has designed a strikingly new convertible galley by getting rid of the "dead-end" alley and in its place creating an island. 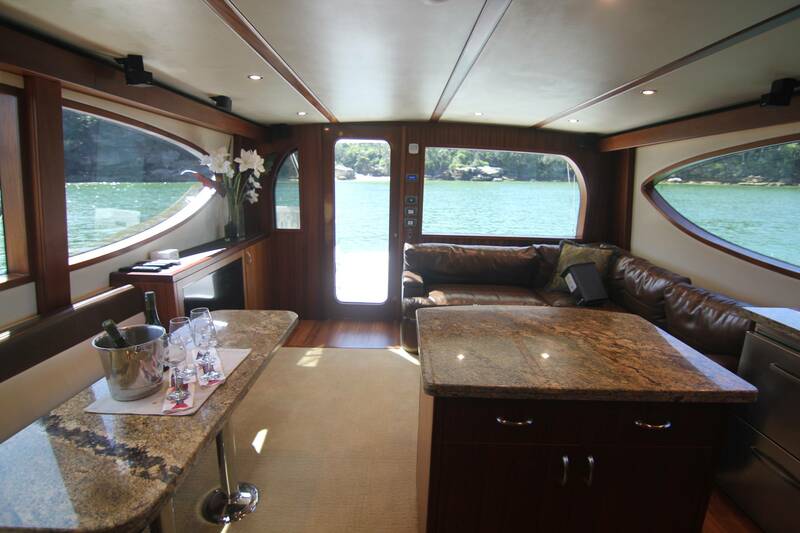 This does several things at once: it allows the galley to be accessed from two sides, not just one, and it creates more galley deck space so that two people can easily work and get around each other. 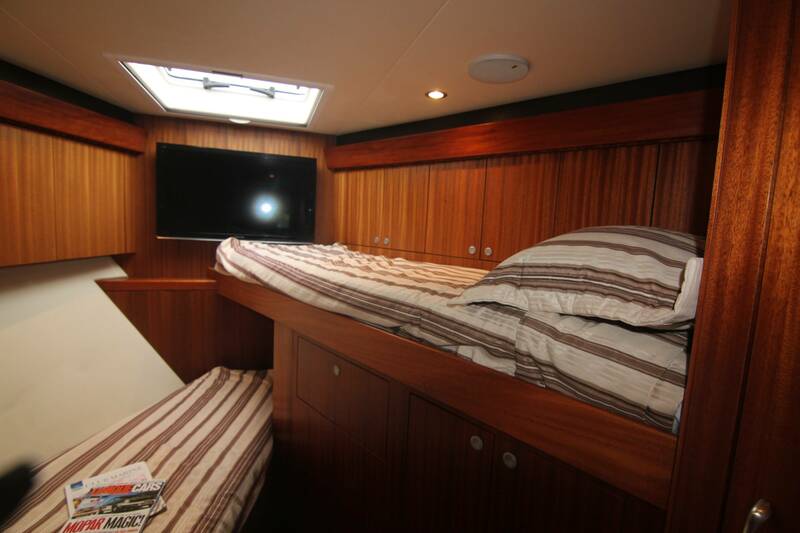 Because outboard galley deck space is not extended all the way to the port side of the deckhouse as it is in conventional designs, there is actually more counter space in this new layout. 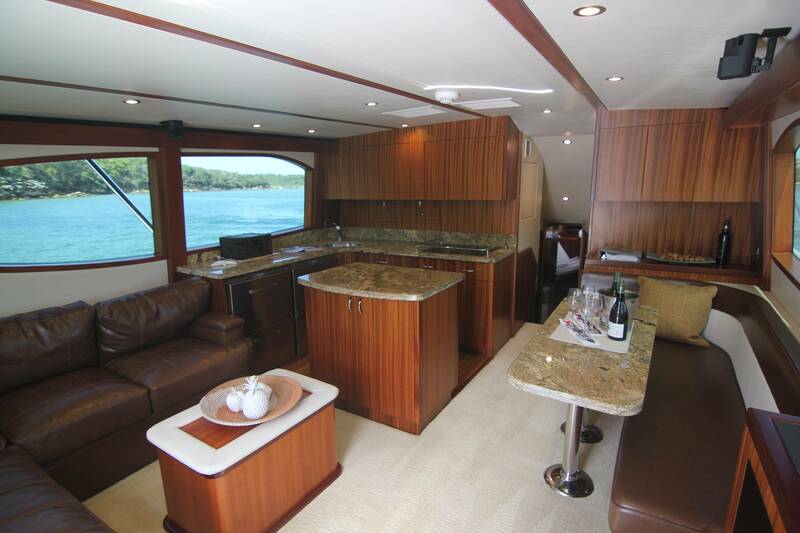 Hatteras tells us that the layout is a hit with women, but men like it, too. 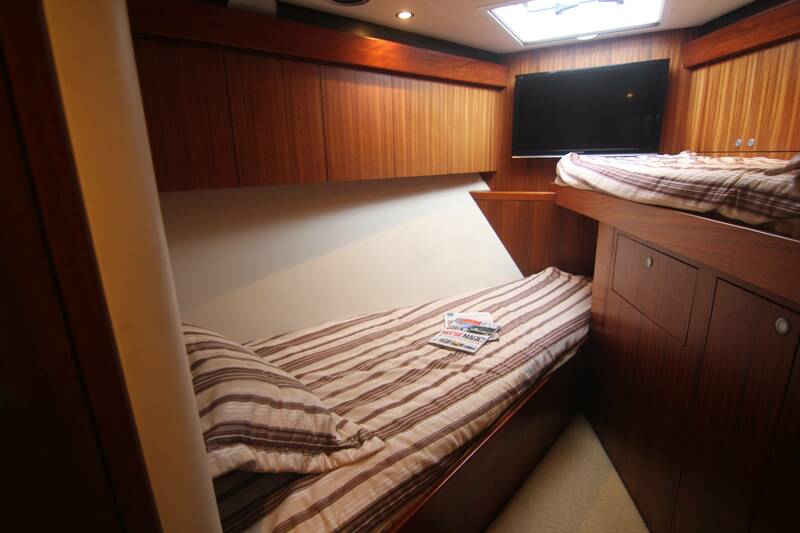 The salon has the typical L-shaped sofa which makes into a bed and also has storage underneath. 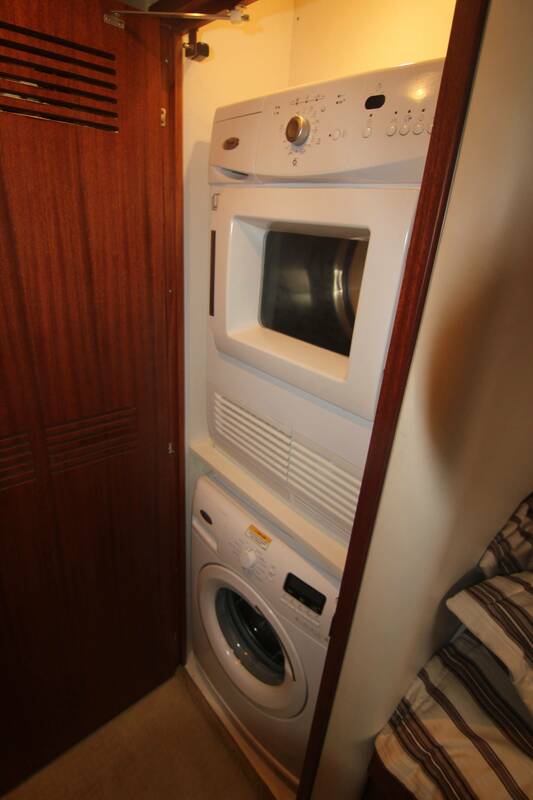 It is a tried-and-true design that has never been improved upon. A coffee table comes standard with storage inside. 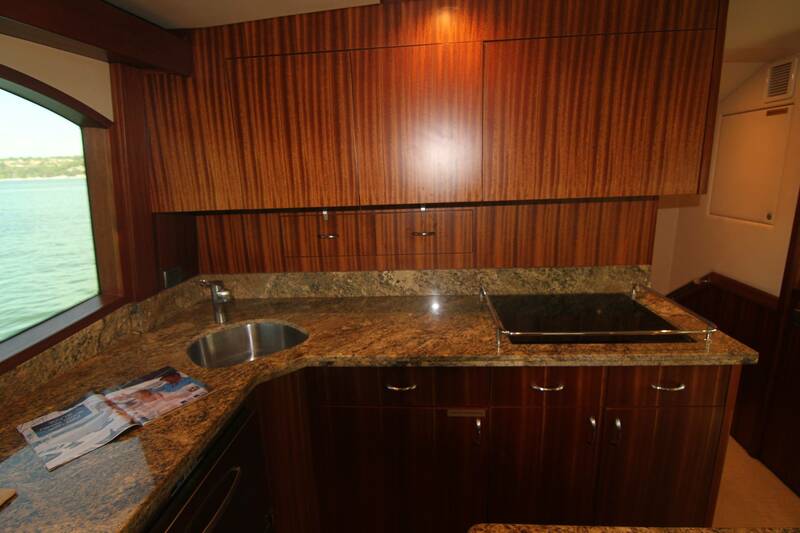 But like the galley, the salon area also appears to be opened up and even if it is only an optical illusion, it is a good thing. 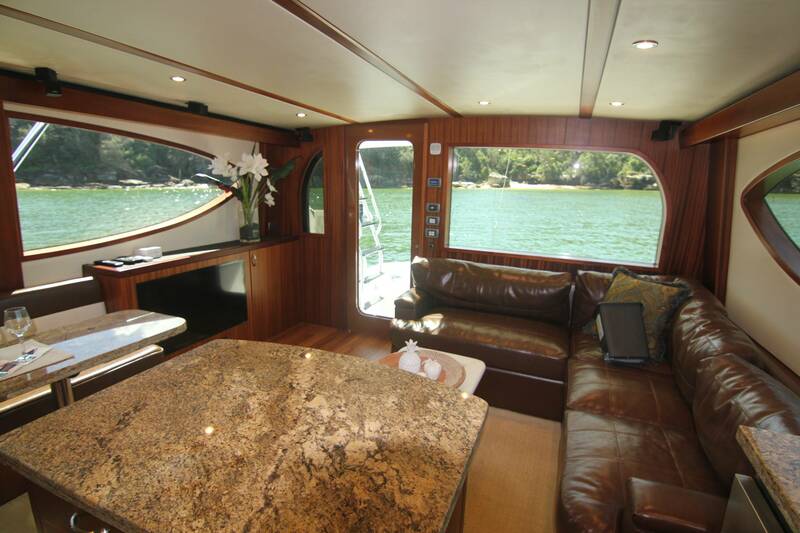 The standard entertainment center and credenza is to starboard. 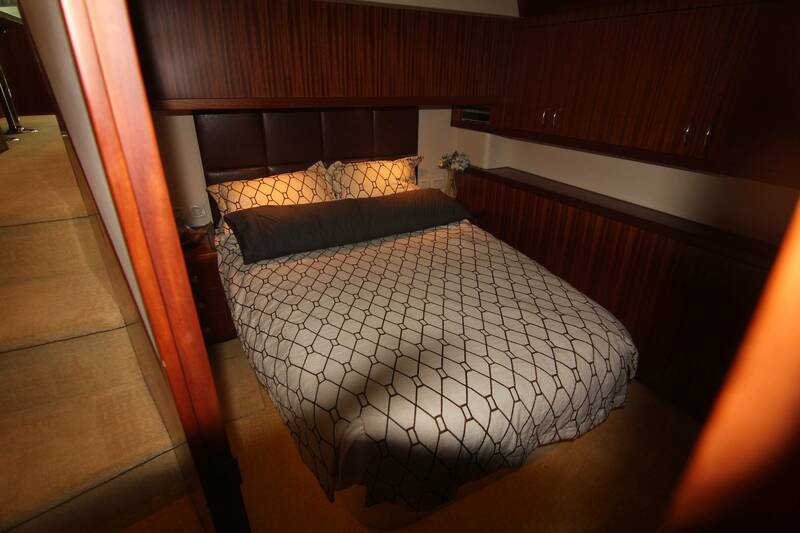 Hatteras has taken a page from megayacht design and disperses its air conditioning over valances port and starboard and has eliminated the ugly grates from which cold air blasted in the old days. 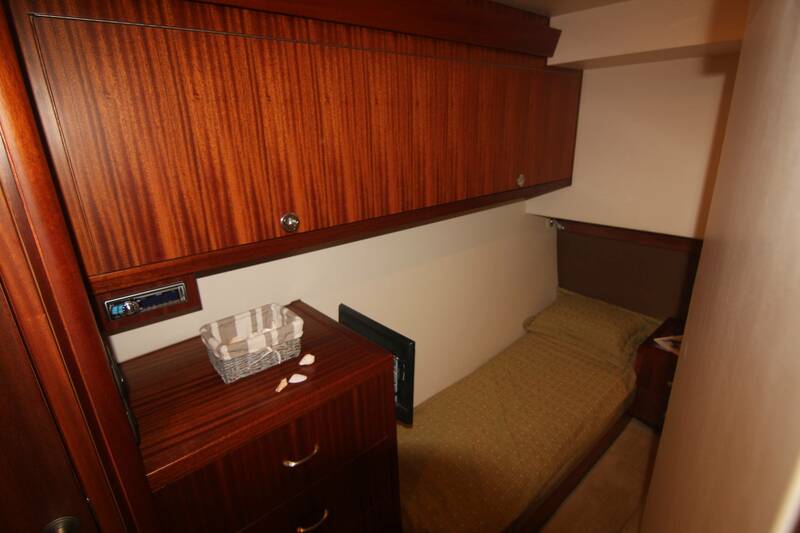 Belowdecks, there's a VIP stateroom forward and a master amidships to port, opposite a third stateroom with two single berths side by side. .
She is an easy size boat for an owner/operator to handle, and finding dock space is generally no problem in this size range. 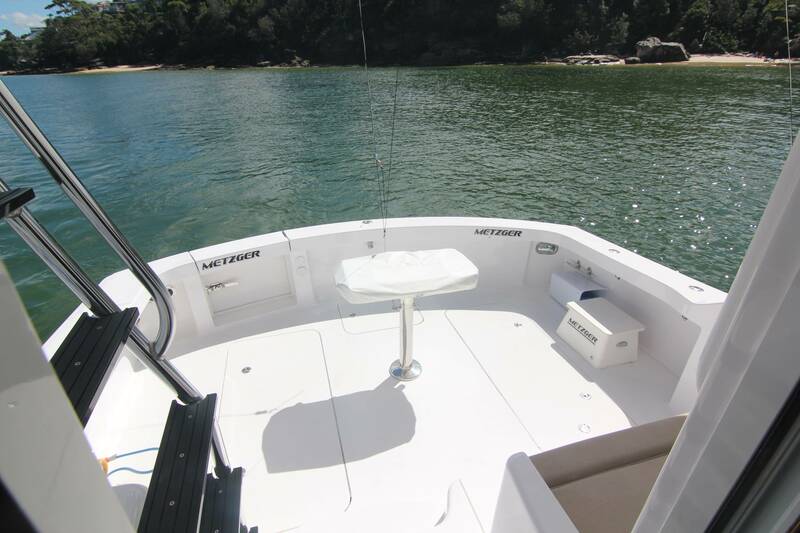 The boat has an optional bow thruster, but most veteran boaters won't need it. 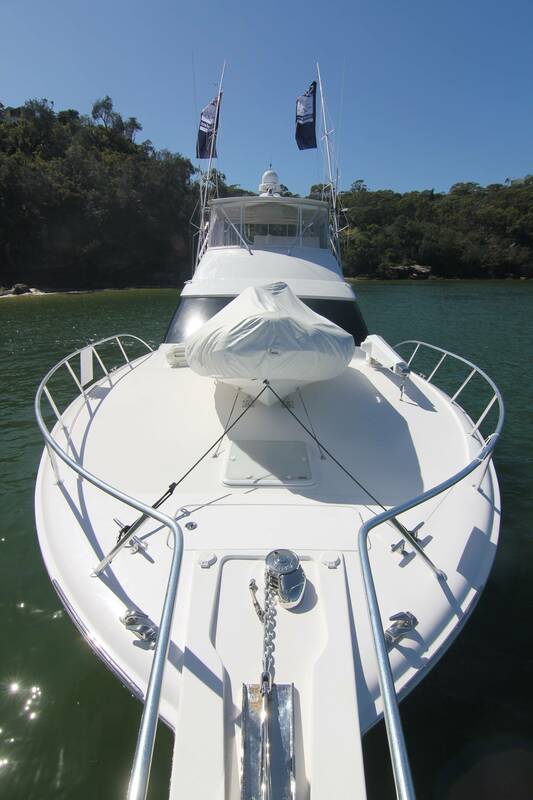 And she is not so big that it takes a crew of people four hours to wash her down after a day on the water. 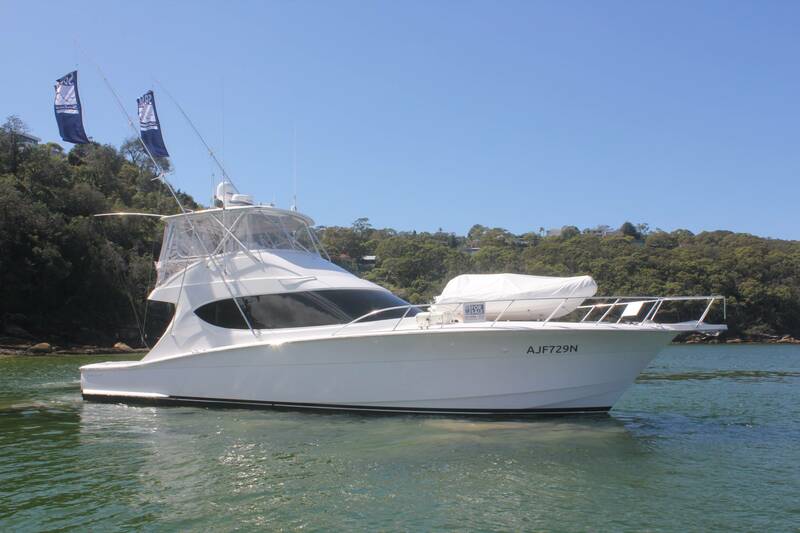 For all of these reasons a 54' convertible makes a good solution to many peoples' boating needs and we think the Hatteras GT54 has much to recommend her. 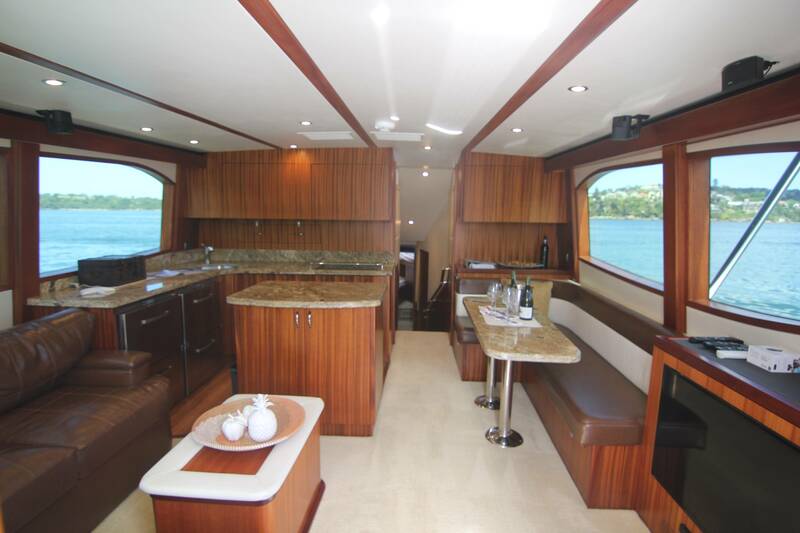 This truly amazing boat is a once in a lifetime opportunity and the cheapest 54GT fro sale globally. 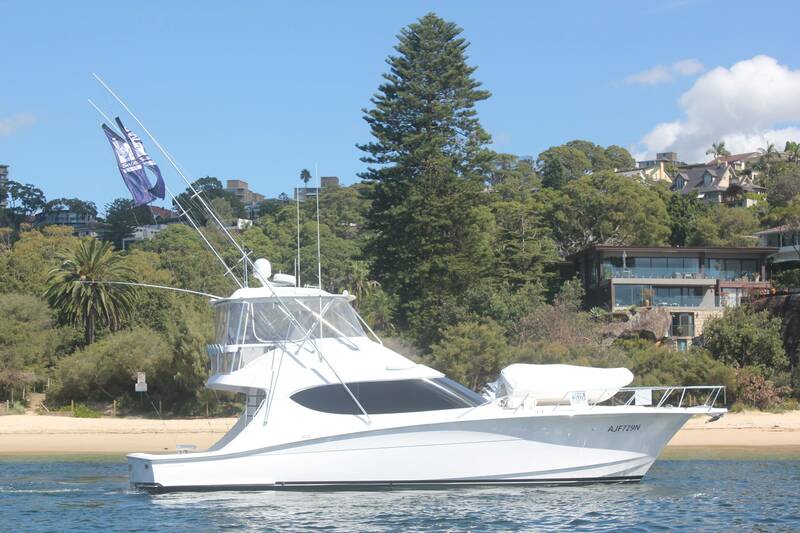 Set your sails on this beast and start creating dreams with your family and friends that will last an eternity! 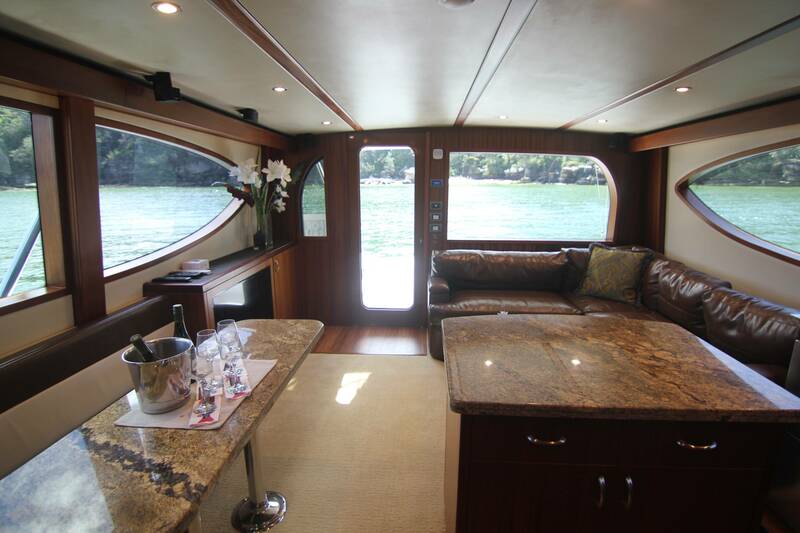 Enjoy this boat while your still fit and able to utilize her to her expansive capabilities! !